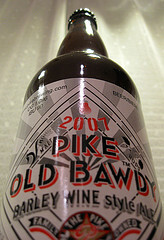 Pike Brewing released the 2012 batch of Old Bawdy Barley Wine on New Year’s Eve. If you haven’t had a chance to try it yet, this Friday is a great time to head down to the Pike Pub. They will be pouring 7 different vintages of Pike Old Bawdy, starting with the 2006 batch and going all the way through the fresh 2012 batch. If you are new to barleywines or have not had the pleasure of tasting older vintages of this high-alcohol style, you are in for a treat. Barleywines typically age very well and can develop in complexity with a few years of age. A vertical tasting like this one is a great chance to compare side-by-side and see how the beer is progressing as it ages. I had a chance to taste the 2012 batch yesterday, and I quite enjoyed it. The hop flavors and bitterness seem more prominent than in the past few years, and it should be quite the contrast to taste it next to some older batches that have lost some of their bitterness and intensity. The event will take place in the Museum Room at the Pike Pub from 6pm to 9pm this Friday, January 11. The cost to taste them all is $20 if you RSVP by January 10 and $25 at the door. If you are a member of WABL or the Pike Pub Club, the cost is $15 (passport required). RSVP to tshuttleworth@pikebrewing.com or 206-812-6604.